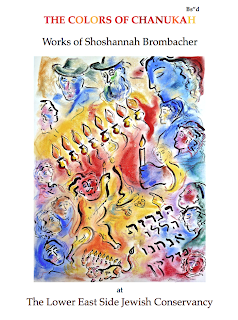 The All-day Festival Features Art Exhibit Opening Colors of Chanukah: The Art of Shoshanah Brombacher. 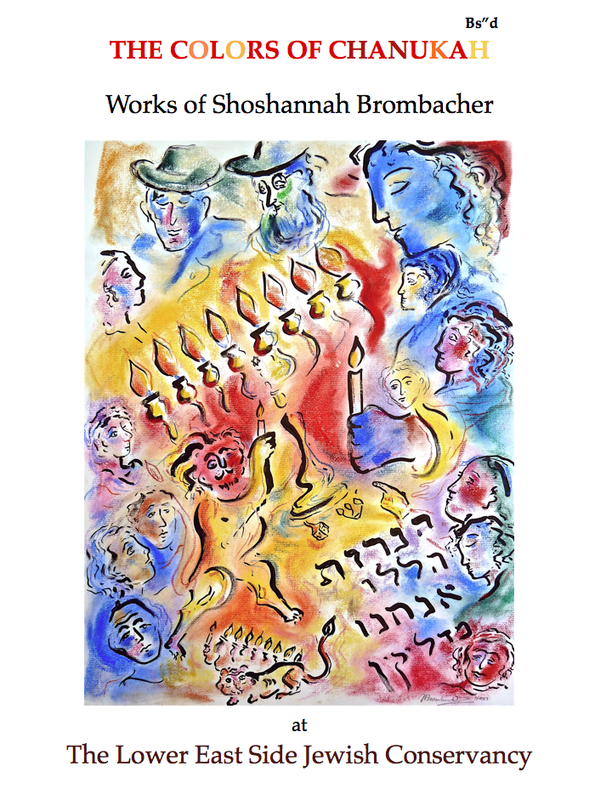 The Lower East Side Jewish Conservancy will open Colors of Chanukah: The Art of Shoshanah Brombacher. The exhibit showcases lively, colorful oil paintings exploring Chasidic-Jewish themes and folklore. Brombacher will be on hand at the LESJC Kling & Niman Family Visitor Center to give a live presentation of her works at 1:30 PM. The exhibit is only one part of the day-long Fifth Jewish Heritage Festival. The activity-packed day of exploring and learning about the Jewish history of Manhattan's Lower East Side includes three walking tours of the neighborhood, a vintage goods benefit sale and “Gals From the Hood,” a special presentation by four renowned guest speakers. Events kick off at 10:45 AM at the LESJC Kling & Niman Family Visitor Center, with two simultaneous walking tours exploring the historic neighborhood. "Bialystoker the Beautiful" is a 90-minute tour of the magnificent Bialystoker Synagogue, which was built in 1826 as a Methodist church, and its surroundings. The "Bialystoker the Beautiful" tour is presented a second time at 3:00 PM. Also beginning at 10:45 AM is the "Crossing Delancey" tour, which examines three of the oldest synagogues in New York City: Congregation Chasam Sopher, the Orensanz Foundation, and Congregation B'nei Jacob Anshei Brzezan, one of only two remaining tenement style synagogues left on the Lower East Side. The festivities continue at 12:30 PM at the Kling & Niman Family Visitor Center with Gals From the Hood, a presentation about what life was like for Jewish women on the Lower East Side. In this engaging presentation, four women who grew up together on the Lower East Side, and have remained friends for over 50 years, discuss the experiences of their families in the neighborhood. Panelists include Hesta Fortgang, (co-owner of Tag-Along Estate Sales), Marilyn Guss Altman (daughter of the founder of Guss's Pickles), Carol Schneider Margolin (daughter of the K'nish Man) and Carol Hordin (daughter of the founder of Hordin's Deli). The four women will also be sponsoring a benefit sale throughout the day, with vintage goods for the home, fashion jewelry, artifacts and serving ware available for purchase. All sale proceeds will benefit the Lower East Side Jewish Conservancy. All three tours meet at the Lower East Side Jewish Conservancy Kling & Niman Family Visitor Center at 400 Grand Street, between Clinton and Suffolk Streets. Admission for all tours is $12 for adults and $10 for students and seniors and available at http://www.nycjewishtours.org/calendar.htm#101313. Children age 8 and under tour for free. Tickets are $2 additional day of tours. Shoshannah Brombacher studied Semitic Languages, Ancient Middle Eastern Culture and Codicology at Holland’s University of Leyden and specialized in medieval Sephardic Hebrew poetry. Though she attended art classes in Leyden and at the Free Art Academy of The Hague in Holland, she considers herself a self-taught artist. Brombacher sees her academic background and her extensive traveling as an invaluable tool for her paintings, which delve deeply into Jewish lore and legends. She now lives in New York and devotes her time to her art, writing and to her husband and two children. The Lower East Side Jewish Conservancy is a not-for-profit organization dedicated to preserving, sharing and celebrating the Jewish Heritage of the Lower East Side. The Conservancy aims to raise public awareness of the Lower East Side’s distinct cultural identity through innovative public walking tours and other programs, while supporting the neighborhood’s community of living synagogues and other historic structures.